Not that I just pulled these off in a few weeks. Both have been patiently waiting for quite awhile. 1. Being afraid of a sweater being too small will result in a sweater that is too big. 3. 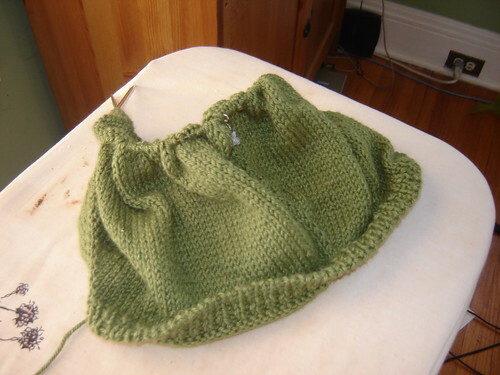 Knitting and blocking a gauge swatch will not always result in a perfectly fitted sweater. Knowledge of your yarn is a must as well. In this case, 100% wool and I would have been fine. But this combo of alpaca, silk and merino resulted in a heavier sweater with less memory. Hence the growth in blocking and wearing, and a sweater that is too big. 4. I’m not as cleaver as I think I am. Adding two stitches to each front edge as to have enough room to add buttons onto something that already has plenty of stretch just results in a sweater that overlaps too much. Duh. 5. Taking a photo at this angle is just a bad idea, especially after having three babies, since I seem to look somewhat inflated. 6. A shawl pin can fix a lot. 7. Despite the one size too bigness of this sweater, I am still about 85% happy with it. Poor Knittykid. This was meant to be his sweater. But summer came and I stuck it in the closet. Imagine my surprise when I pulled it out this fall (two years later! ), nearly completed and just the right size for Spinner. He’s been living in it now that it’s finished. 1. I really don’t like intarsia. 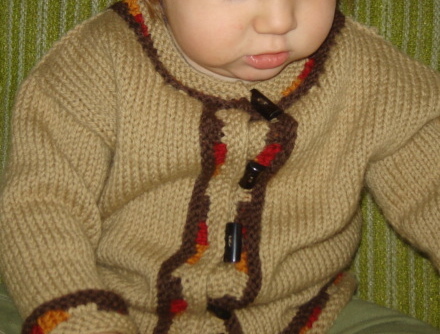 Especially this much intarsia. 2. Putting a sweater away in the closet for while is not necessarily a bad thing. Other excitement…mostly for the locals. My part of Minneapolis has tended to be a bit of a void when it comes to fiber and textile supplies. I did always have a quilting shop close by, but that was it. I had a 15-20 minute drive for everything else. Then The Fiber Studio came, a mere five minute drive from my house. (She’s got Pigeon Roof now, BTW…) I had quilting fabric and fiber at quick access, but that was it. Now two more shops have opened up. Sewtropolis, a fabric and sewing studio that focuses more on clothing side of sewing, and Steven Be, owned by the same guy who owns The Yarn Garage. Now I’ve got more fabric ten minutes from home and a huge yarn store just five minutes from my house. Yes, five minutes. I can walk there. Shocking, absolutely shocking. So, for my local friends, two more places to check out when you’ve got the time. If you head to Steven Be’s, be sure to know that the entrance is around the back…it feels a little like a yarn speakeasy. I felt like I should have to say a password to get in. But once you go inside you’ll be welcomed and completely floored, it is probably one of the more beautiful yarn stores I’ve been in. Over at Sewtropolis, Nikol is warm and helpful. She’s got a great class list; I just signed up for the A-line skirt class yesterday. Now, everyone wish me luck as I try to figure out my new toy this weekend! Thank you, Marsha, for wondering why I had all that sweater yarn in my stash when I was not knitting sweaters. 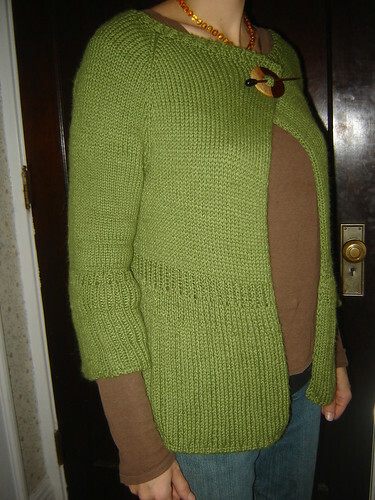 This will now be sweater number two for 2009, Diminishing Ribs Cardigan. That’s Knitpicks Andean Silk. As for the quilt, I went with a mix of the warm and cool, thanks to a Quilt-Along member over on Flickr who clipped them and moved them around….Now I need to press and cut!